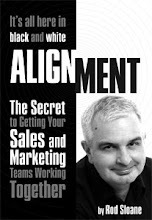 Sales and Marketing Alignment Blog from Rod Sloane: How do you market and sell a commodity? What if your prospects see your products and services as being similar if not identical to other suppliers. Then, what do you have to market? Availability, service, price, delivery. These are hard things to compete on, because things can go wrong. How about competing on you? Not invisible stuff like integrity and authenticity. How about being able to tell your story? Why do you do what you do? How about competing on your difference. How are you different to your competition?